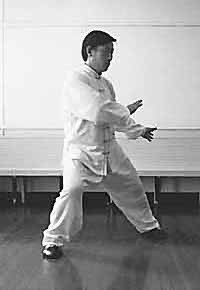 Silk reeling energy (chan ssu jing) is essential to its practice within tai chi for health and for it’s efficient use as a martial art. 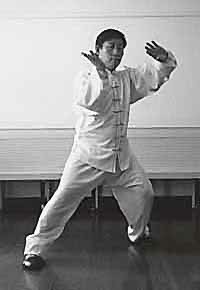 Training in Tai Chi Chuan, regardless of style, has as its function the connection of reeling energy throughout the body which makes it strong, fluid and accessible. It takes its name from the movement of the silk worm itself and the external movements of the form looks like the external work of the silkworm as it making silk. 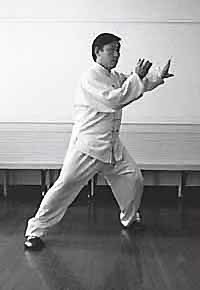 Chen Xiaowang, 19th generation successor to the Chen Style, compared the actual physical activity of the reeling technique of the human body to the action of a towel that is wrung to squeeze out water. But this action is not just squeezing a towel with the hands, but a coordinated movement of the body that involves hands, arms shoulder, waist, hips and knee, all together. It is as if the body itself was squeezing itself as if it were a towel. 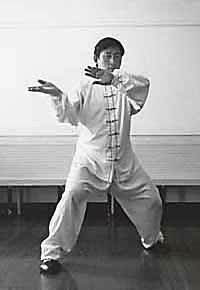 The physical process involves the dantian, mingmen point in the small of the back behind the navel, the waist, back and shoulder right through the arms to the hands, and down through the hips to the knees and feet. The movement of everything goes together. The spiraling of the waist, creates spiraling of the shoulder, elbow and wrist as well as the hips, knees and ankles. The whole thing is called reeling silk. "There are three basic principles of movement. The first is spiraling. The second is anterior/posterior extension. The third is putting together the spiral with anterior and posterior flexion of the spine." While this complex change is taking place, the dantian, (the energy center in the abdomen a few inches below the navel) is the center. For the first movement of the Chen style there is an axis that would go through the dantian horizontally from the navel to the acupuncture point directly opposite in the back. In the second movement, the axis would be vertical, like the hands of a clock at 6 o’clock. There can be many different axes that intersect in the dantian during a movement, but the point of intersection never changes. For the majority of movements, two axes cross, both acting at the same time. But the number of axis can be almost an infinite. 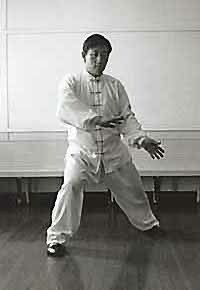 Silk reeling exercises, can involve as little as one axis, as long as the whole body is moving together as one unity. 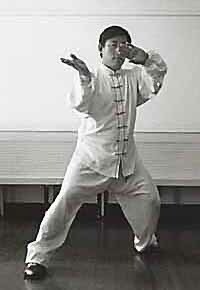 The mechanics of doing the silk reeling exercises involve using the mind as well as the waist, dantian and chi. 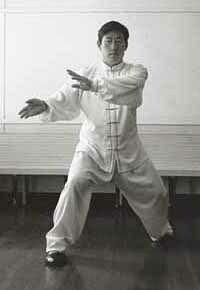 The waist moves first, followed by the dantian and then the chi. 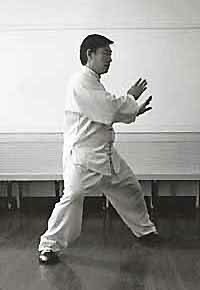 It is difficult to separate these actions since mind moves first, causing the subsequent waist, dantian and chi action. The movement of the waist involves muscle, but the dantian doesn’t use muscle, it relaxes. It doesn't matter what axis you are moving around on as long as the body is moving as one functional unit, connected so that when one part of the body moves, the whole body moves. When you do these exercises, when you do any movement or fajing (explosive force), the whole body is involved and moves as one unit. 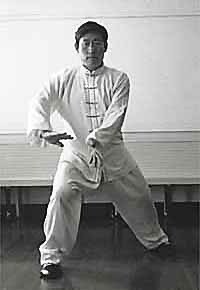 If students do not train in silk reeling, they may only be able to use 40 to 50 percent of their body to do any one tai chi movement. 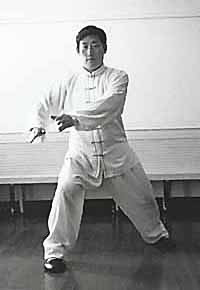 If you are well-trained in reeling silk concepts, on the other hand then movements will be a full body tai chi movements which involve your total body and you will be able to use 95 or even 99 percent of your body’s functional potential. You must use 100 percent of your body to get 100 percent of your functional capacity to do a strike. Another example could be pushing a car if you were to push the car using only your arms then you would not get to far. People generally push a car by saying one, two, three and on the third count push with there whole body. This without many realizing it is rather like reeling up the energy in reeling silk. The reason why a person would want to move each body segment together - waist, knee, hips, ankles, and shoulders – is to use his whole body to accomplish the strike, push etc. All parts of the body that move are correlated with the dantian, even the fingers. While rotating the hand, the arm and the shoulder, the waist is turning and all move together. The mind is the first to move and then the mind will simultaneously move the waist and the dantian together. Whether one moves first or the together moves first, you can’t differentiate because they are one and the same, however the mind cannot move the dantian first. It has to move the waist and allow the waist to move the dantian. The dantian must remain relaxes. There must be no contraction in that area. Once you contract and make it tight, then energy is blocked there. It doesn't matter what axis you are moving around on as long as the body is moving as one functional unit. The spiraling of the waist, creates spiraling of the shoulder, elbow and wrist as well as the hips, knees and ankles. Everything must be natural. Only in this state of being natural would the qi circulate appropriately. The whole body is involved and moves as one unit.